The name of James R. Gray will occupy a fairly permanent place in the history of the men who had quite a large hand in the upbuilding of the New South. The newspaper of which he was for quite a few years the active directing head has held a prominent place among the big and successful papers of the South. The [Atlanta] Journal has pretty largely reflected Mr. Gray's personality in its general bigness in a physical way and the calm and unruffled fashion in which it meets issues as they come up and goes on about its way day by day. A man of few words, he saw things in a large way and had the strength and ability to go on with his plans and his ambitions to see the most of them brought into full fruition or to where their success was assured. He held a good many men to him by ties of personal friendship who were not with him in his policies and his determinations, which is after all one of the best tests of inherent character. 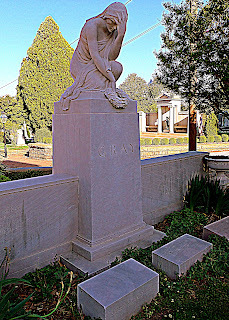 James rests beside his wife May Inman Gray (1862-1940) in Oakland cemetery at Atlanta, Georgia. A notable feature of their lot is the statue of Niobe, a character from Greek Mythology that personifies grief.